Chapter 3 What can I do to help myself? - Just How Powerful is Our Mind? One of the worst feelings about being diagnosed with cancer is the complete sense of helplessness, anger and fear. What about my family, my job? Will I get even sicker? How will my friends and employer react? "Doctors, and in particular oncologists, because of their type of work, generally believe that they cannot be in the 'hope' business. Accordingly they are often seen by cancer patients as cold, uncaring and most unsympathetic. This, combined with the apparent belief by many cancer specialists and doctors that there is nothing a cancer patient can do other than to present their diseased body for treatment, leads a patient to often experience extreme helplessness and fear. I CAN help myself to provide the best chance of recovery and to achieve an overall improvement in the quality of my life. The following brief story perhaps helps to illustrate the potential power of the mind. All my life, I had a dark brown birthmark in the form of a 'Hutchinson' freckle (about the size of a ten-cent piece) just near the front and middle of my lower neck where the two collar bones meet. Over the years, various doctors had examined this 'Hutchinson' freckle to ensure that it was not growing or becoming larger. It never did change in colour and remained dormant. After commencing meditation, I decided to focus on this freckle for no other reason other than to practice my creative visualization. So during each meditation, I would visualize my white cells of the immune system coming up and 'massaging away' this brown mark. I felt I had become quite good at the technique and one morning, while standing in the bathroom cleaning my teeth, I looked into the mirror and couldn't believe my eyes… the entire freckle was gone. In disbelief, I called my wife Katherine and asked if she though my 'Hutchinson' freckle was getting smaller. After 40 plus years, the freckle was gone. A week later, I visited my dermatologist and he too was (very) surprised to see what had happened. But like most doctors, there has to be a medical reason behind everything. His explanation was that 'on occasions, the immune system can attack foreign objects such as tumors, and my case, a 'Hutchinson' freckle - reducing or eliminating them completely'. This, no doubt, is probably true but I was left wondering what stimulated the white cells to do this? While I cannot conclusively say it was the meditation and creative visualization that eliminated the freckle, I have no doubt in my mind as to what was the driving force that stimulated the immune system to bring about this 'small miracle'! 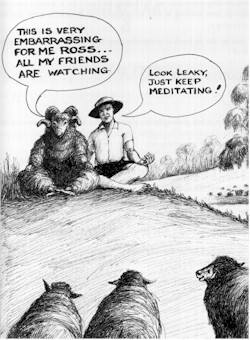 Meditation can also bring some very special moments, and such a moment occurred recently while Katherine and I were visiting a farm (some 200km south of Perth) owned by friends Geoff and Ronnie Willis. On the first morning I decided to take advantage of the beautiful weather - cool and clear - and meditate on a ridge overlooking a small lake and stream. It was 5.30am and I found a nice large stone upon which to sit. As the sun made its appearance over the distant hill I commenced what was going to be a very peaceful meditation. Ten minutes later, with eyes closed and my mind in a still and quiet state, I became aware of a 'presence' very close to me. A short time later the feeling became so strong I slowly turned my head towards the 'presence' and opened my eyes only to find myself nose to nose with a very large sheep (ram). Well, the sheep (whose name was later revealed as 'Leaky' - due to a urinary infection!) didn't go away, preferring to share my meditation and the peaceful energy that was surrounding us. I must say, that the breath of an Australian sheep is not something I would get excited about! As occurred in my own life, I believe that placing unrealistically high expectations upon one's self, combined with a deep-seated need to please everyone, creates an environment whereby the body and soul begins to look for a socially acceptable way out of this unwinnable game! Anger, hurt and bitterness can also cause great damage and create a dangerous 'mind-set' along with the considerable unhappiness and sense of being alone. Many cancer patients with whom I have associated, have benefited enormously from having worked the rough a process of learning how to love themselves first and then introduce the concept that 'I'm OK'. In creating a holistic approach to your recovery from cancer it is most important to consider these issues. This can often be difficult to do and therefore counseling can often be very helpful. Emotional issues, should, however, be faced as the other forms of healing, to which I have already referred, can only be fully effective when they work in synergy with emotional healing. I urge you to read this statement again for it is indeed profound.